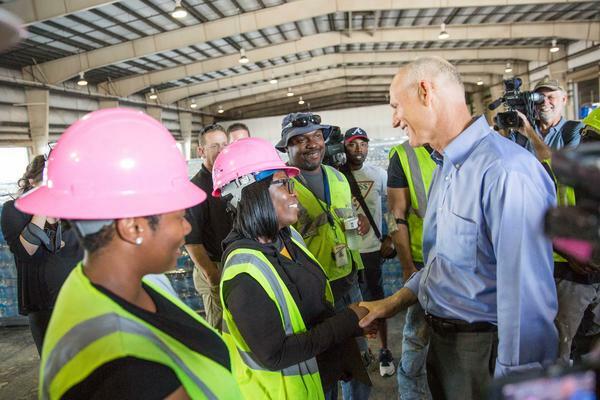 WASHINGTON, D.C. –Today, Governor Rick Scott provided an update on resources being deployed to Puerto Rico to assist with recovery and response efforts following Hurricane Maria. The Florida National Guard (FLNG) continues to monitor and provide support, as needed, to coordinate Emergency Management Assistance Compact (EMAC) force flow into Puerto Rico. Four senior leaders from the FLNG are in Puerto Rico providing support for air space operations and communications. These personnel assisted with movement of FDLE personnel and equipment into Puerto Rico over the past weekend. The Florida Air National Guard's 101st Air and Space Operations Group (AOG) continues to coordinate all military airflow in the Joint Operations Area through the execution of the AOC's Regional Air Mobility Coordination Center (RAMCC). To date, they have coordinated nearly 1,300 flights, bringing nearly 7,000 personnel and 10,000 tons of cargo in support of Puerto Rico and the Virgin Islands. The 202nd Red Horse Squadron (202 RHS) is sending 26 Airmen and a Disaster Relief Beddown Set (DRBS) to Puerto Rico via sealift out of JAX Port. The 202 RHS is a construction and engineering squadron. The DRBS will support 150 personnel. It includes one all-terrain forklift, billets, shower and latrine facilities, a kitchen and self-help laundry machines. The DRBS also has water purification capabilities. · The Florida Department of Law Enforcement (FDLE) traveled to San Juan with Governor Scott and met with the Puerto Rico Department of Public Safety to discuss security concerns and needs. · FDLE has coordinated a request for 160 law enforcement officers that are standing by to deploy to Puerto Rico to supplement Puerto Rican law enforcement. These assets will come from New Jersey and Michigan. · An eight-member FDLE incident management team is in Puerto Rico to distribute supplies and assist local law enforcement officers. · An eight-member multi-agency incident management team is in Puerto Rico this week to help assess law enforcement needs. Agencies with members on the team include FDLE, FWC, FHP and DFS. · The Florida Fish and Wildlife Conservation Commission (FWC) has identified volunteers from across the state that are part of the FWC Special Operations Group (SOG) to stand by for potential deployment. Many of these officers have recently deployed to assist with Hurricanes Harvey and Hurricane Irma response and recovery operations. · FWC has identified specialty equipment such as trucks, coastal and river patrol boats, ATVs and shallow draft boats to be considered for potential use as needed. · The Department of Highway Safety and Motor Vehicles has deployed Florida Licensing on Wheels (FLOW) Mobiles to the relief center at the Orlando International Airport and the Miami International Airport to provide credentialing services to impacted customers. In Orlando, two FLOW Mobile buses are outside the relief center and one FLOW mini unit is inside the relief center. In Miami, one FLOW Mobile bus is outside the relief center and one FLOW mini unit is inside the relief center. At the direction of Governor Scott, three Disaster Relief Centers (DRCs) have opened at Orlando International Airport, Miami International Airport, and the Port of Miami for Puerto Rican families displaced by Hurricane Maria. The following organizations will have staff on site: Federal Emergency Management Agency, Department of Children and Families, Department of Highway Safety and Motor Vehicles, Department of Agriculture and Consumer Services, Department of Health, Department of Economic Opportunity, American Red Cross and Catholic Charities (Orlando International Airport). These partners will offer services such as help with registering for FEMA Individual Assistance, crisis counseling, Supplemental Nutrition Assistance Program (SNAP) information, assistance with unaccompanied minors and agency social services, assistance with animal services, medical attention and health concerns, employment information and training services, food and water resources, language guidance and spiritual care. The hours of operation for these centers are 7:00 a.m. – 9:00 p.m., including weekends. Since October 3rd, 2017, more than 27,000 individuals arrived in Florida from Puerto Rico through Miami International Airport, Orlando International Airport and Port Everglades. The State Emergency Response Team (SERT) is working closely with Puerto Rican officials to help identify, prioritize and affect Emergency Management Assistance Compact missions, allowing for the right resources and personnel from the continental U.S. to be appropriately leveraged in support of the response effort. SERT has coordinated with private partners to secure three large transport vessels that have a combined passenger capacity of more than 7,500 individuals. SERT is working with private cellular infrastructure repair and support companies to assist the Puerto Rico response effort and deploy personnel, repair equipment, trucks and fuel needed for critical communications infrastructure repairs. SERT is identifying relief supplies for deployment. More than 2 million pounds of relief supplies are positioned in the Tampa Bay area for two large cargo aircraft transporting them to airports outside of San Juan. In addition, four hangars across the Tampa and Orlando areas are full of relief supplies are on standby for air transport. 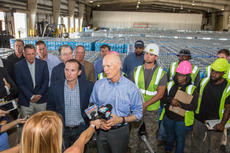 Available relief supplies include 220 Florida Point of Distribution (POD) support packages which are used for the distribution of water, food, and supplies to the public, 50 6,000-gallon potable water tankers, 300 fork lifts, 10 kitchen support units, 10 shower/laundry facilities, 1,000 light towers, and 1,200 portable generators standing by for transport to Puerto Rico as needed. In addition, Lowe’s is currently transporting 30 trailers worth of portable generators to Homestead for transport to Puerto Rico. SERT is working with utility partners at the State Emergency Operations Center to identify resources that may be offered to Puerto Rico. This includes personnel, repair equipment and expertise. Additionally, FPL has offered assessment teams that can quickly deploy and assist in determining critical infrastructure needs. SERT is working with fuel industry partners to secure ships transporting fuel, fuel trucks and bilingual drivers to transport fuel to areas with the most critical need. Two fuel barges are on standby for deployment. SERT, through the Florida Retail Federation, is coordinating with Florida’s major retailers in ensuring the availability and distribution of needed goods. SERT coordinated with the Humane Society of the United States to support pet and animal shelters in San Juan. · The state coordinated with Florida International University to host evacuees from Puerto Rico and the Virgin Islands, 90 of which were dialysis patients, at Florida International University. · The state is currently on the list of Federal Coordinating Centers (FCCs) to accept patients if needed from Puerto Rico as recovery efforts continue. The Florida Department of Health (DOH) will stand ready to coordinate patient transport as needed. · DOH is providing education on available public health services at Disaster Relief Centers in South Florida and Orlando for Puerto Rican families displaced by Hurricane Maria. · The Agency for Health Care Administration will work with our federal partners to gather information on any waivers the Medicaid program would need to serve individuals from Puerto Rico. As always, the Medicaid program covers medically necessary services for children and families eligible for Medicaid. The Florida Department of Transportation (FDOT) is prepared to deploy a team to assess infrastructure status and needs and coordinate further related deployments. FDOT is working to fulfill a request from Puerto Rico to assist in evaluating the current status of traffic signals and Intelligent Transportation Systems (ITS) field devices. FDOT has been in communication with Puerto Rico’s Secretary of Transportation and Public Works regarding transportation needs. The Governor has called on Florida port directors to prioritize and expedite the shipment of goods from across the country quickly to Puerto Rico and many ports have committed to stand ready to help move supplies through their facilities as quickly as possible. Volunteer Florida is providing information and resources to Floridians who want to make donations or volunteer at www.volunteerflorida.org. Volunteer Florida is coordinating with Disaster Relief Centers in Orlando and Miami to serve displaced families from Puerto Rico. The United Way - providing registration for food assistance, housing assistance, medical needs and referrals to case management for extended needs. Red Cross - providing family Reunification and is staffing the comfort station, providing water, snacks, comfort kits and sheltering if needed. Governor Rick Scott directed the Florida Department of Business and Professional Regulation (DBPR) Secretary Jonathan Zachem to issue an Emergency Order suspending all fees required for occupational license applications for residents of Puerto Rico who were impacted by Hurricane Maria and are now in Florida. This includes over 50 different individual professional license types, such as barbers and realtors. By suspending fees, residents from Puerto Rico will be able to obtain a license from the state more quickly and continue their careers in Florida. To view the order, click HERE. The Department of Economic Opportunity (DEO) and the local CareerSource boards deployed staff to meet evacuees at the Disaster Assistance Centers (DACs) opened at the Miami International Airport and Orlando International Airport last week. Staff are on-site to provide information about resources available to assist them in Florida. The Florida Retail Federation (FRF) is working with the State Emergency Response Team (SERT) and Florida’s major retailers to help Puerto Rico retailers’ operational status and requests for assistance. Florida school districts have processes in place to enroll K-12 students displaced by natural disasters, and all districts are prepared to enroll Puerto Rican evacuees. Families displaced by Hurricane Maria have begun arriving in Florida, and a number have already enrolled their students. At Governor Scott’s direction, the Office of Early Learning (OEL) has temporarily waived rules and regulations that will allow Florida’s 30 early learning coalitions to enroll Puerto Rican children whose education records are unavailable due to the storm. This will make it easier for young children to continue their early learning education through Florida Voluntary Prekindergarten Program (VPK) and School Readiness Programs. To view the order, click HERE. At Governor Scott’s direction, the Florida Department of Education (DOE) has temporarily waived rules and regulations that will allow Florida public school districts to enroll Puerto Rican students whose education records are unavailable due to the storm. The Governor also directed DOE to waive the educator certificate application fee and other requirements to help Puerto Rican educators displaced by the storm more easily continue their teaching careers in Florida.Upon receiving a request from a district superintendent, DOE will waive the application fee for an initial educator certificate and will allow the acceptance of an unofficial transcript of teaching degrees or copies of a valid teaching certificate issued by another state or U.S. territory. To view the order, click HERE. At the direction of Governor Scott, Commissioner Stewart also signed a supplemental order authorizing state colleges to waive existing rules and other requirements to help Puerto Rican students more quickly enroll in college. At the request of Governor Scott, all 28 Florida College System institutions have agreed to offer in-state tuition to Puerto Rican students who were impacted by Hurricane Maria. To view the order, click HERE. Commissioner Stewart issued a summary of guidanceto all districts and will continue to work with school districts on additional issues as they arise. DOE has waived statutory and rule requirements related to residency and student records at Florida’s 48 technical centers. Additionally, all technical centers are offering displaced Puerto Rican students in-state tuition. To view the final order, click HERE. Florida Virtual School will accept 20,000 Puerto Rican students who were displaced by Hurricane Maria to ensure they are able to continue their education. To sign up, contact Liz Chico at (863) 606-8033. Last month, at the request of Puerto Rico Governor Ricardo Rosselló, Governor Scott visited San Juan, Puerto Rico to help coordinate response and recovery efforts. Governor Scott has also met with President Trump and Vice President Pence to discuss his trip to Puerto Rico and actions the State of Florida is taking to help with response and recovery. For more information on state response action for Hurricane Maria, visit www.floridadisaster.org/info/maria.